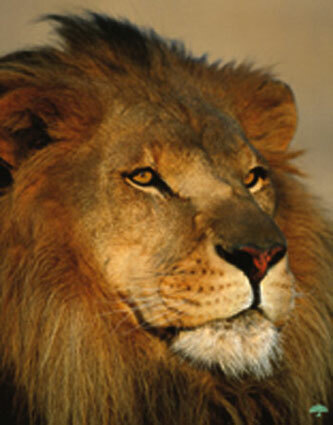 According to Shreveport based television news affiliate KSLA, authorities in and around Marshall, Texas are on the hunt for an African lion. You can check out the story here. The Marshall Police Department began receiving phone calls regarding sightings of the big cat last Thursday morning. Several locals reported spotting the lion, estimated to weigh in the neighborhood of 300 lbs., near a train depot in the vicinity of North Washington. According to Marshall residents, the police are taking the reports very seriously. Local resident Shawn Hagerty was quoted as saying, "They were telling us to stay close to the building, stay indoors because that possible threat really is there." According to some other residents, police have been spotted carrying high-powered rifles in case the lion had to be taken down. Personally, I find the bobcat theory completely ludicrous. I just don't see how anyone could mistake a bobcat for a 300 lb. lion. I suppose the cougar explanation could turn out to be correct. 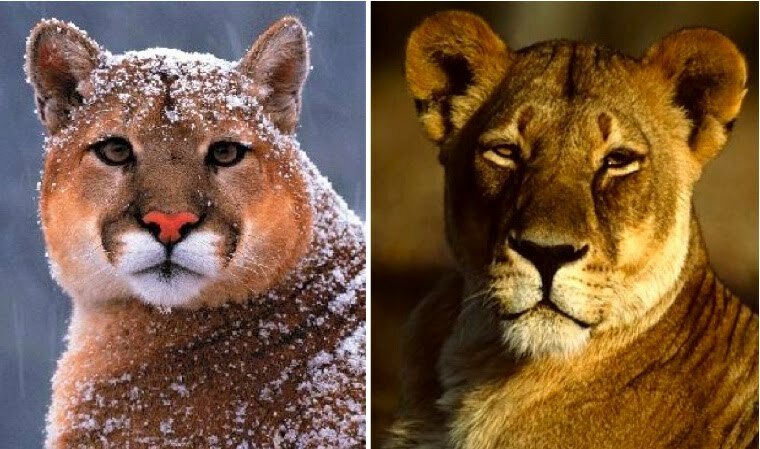 I could see, despite the difference in mass, how a grown cougar could be mistaken for an African lioness (see comparison below). What is not clear from the KSLA post is whether the lion reported has a mane or not. If the cat spotted was a maned male then the cougar explanation just doesn't fly either. If anyone manages to catch a glimpse of this lion or get a picture I would be very interested to hear about it. According to a couple of articles in the Fort Worth Star-Telegram earlier this month, an alligator has been spotted in a pond at Cravens Park in southeast Arlington, Texas which is located in Tarrant County. The park is located a few miles to the northwest of Joe Pool Lake. 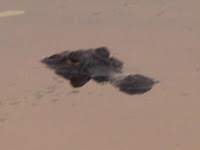 According to the article, written by Susan Schrock, the gator was first reported by students of Bebensee Elementary who spotted the reptile while walking to school. The alligator is approximately five feet long and, as of the writing of the last article, has managed to elude capture for more than a week. Several different methods have been tried in an effort to catch the gator. City officials have tried tempting the alligator with fresh and, in some cases, not so fresh road kill. 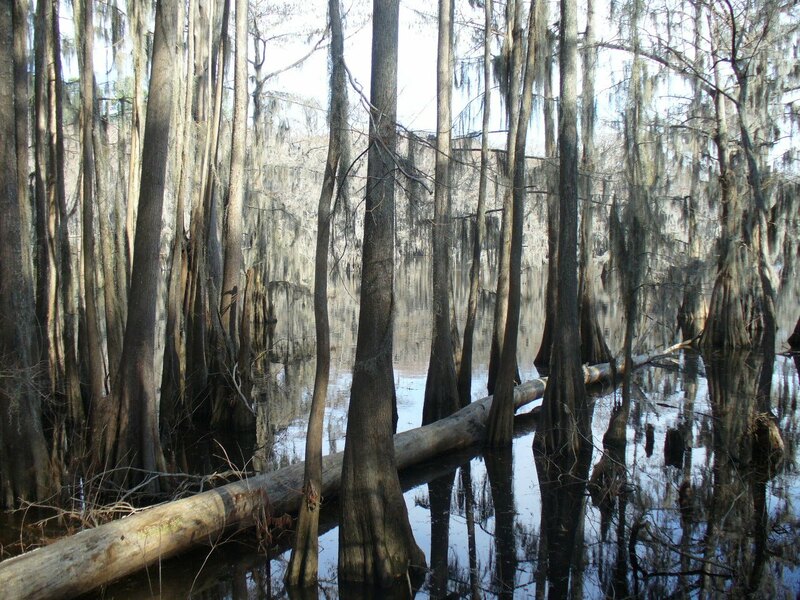 They have also torn down a beaver dam in order to lower the water level in the pond hoping it would isolate the alligator and make it easier to catch. So far, all their efforts have been to no avail. Mike Bass, Assistand Director of Community Services in Arlington, said that the public and media, who have crowded the area hoping for a sighting, have hampered their efforts to catch the elusive reptile. "Every time he feels imposed upon, he goes below the water," Bass said. Bass added that once the alligator is captured it will be humanely released at the Fort Worth Nature Center and Refuge. 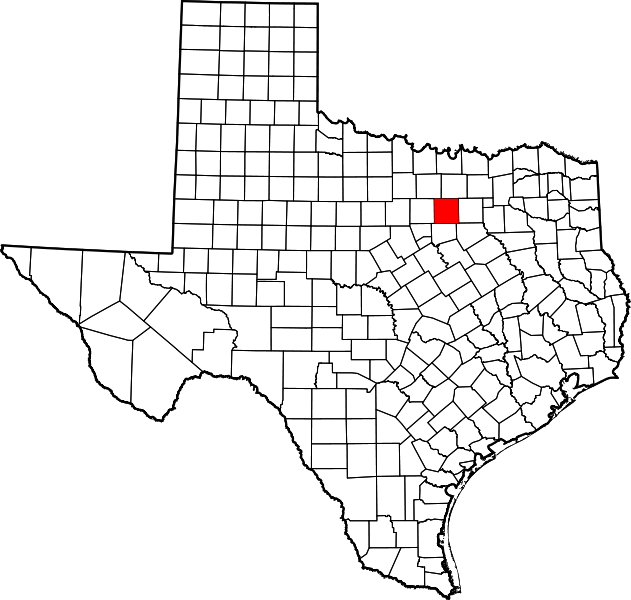 Arlington is located in Tarrant County and lies almost directly between Dallas and Fort Worth. 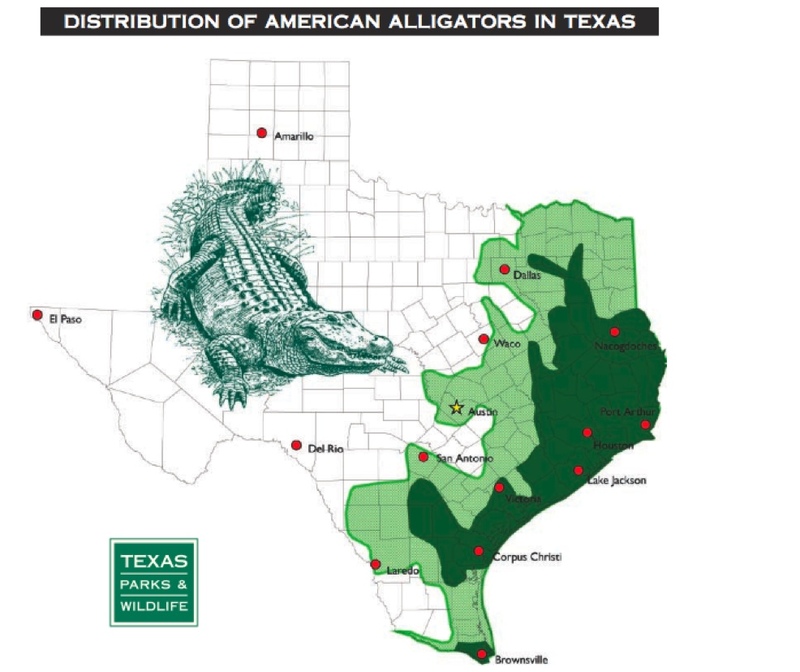 As you can see from the graphics below, this is on the extreme northwestern edge of what is considered to be the alligator's range in the state. Based on this, the alligator really shouldn't be considered "out of place", I suppose. I do know, however, and the news articles allude to this as well, that alligator sightings in and around this area, with the possible exception of the Trinity River, are pretty rare. Ordinarily I would say that the best thing to do is to let the alligator alone. If common sense is used there really should not be a problem between the alligator and humans. However, the fact that this gator has taken up residence right next to an elementary school makes the removal of the animal necessary. If anyone has heard anything new about whether this gator has been captured please let me know. You can view the latest Fort Worth Star-Telegram article here. I have posted many of the photos I snapped during my recent trip to SE Texas. This is the trip that resulted in the discovery of possible sasquatch tracks in a dry creek bed. You can view the photo album on the Texas Cryptid Hunter Facebook page. You can hit the link here or to the lower right under my "recommended sites" header. I know many of you are waiting on an update on the possible sasquatch tracks that I and fellow TBRC member Daryl Colyer located in SE Texas last Mother's Day weekend. I don't have much to add just yet but thought I would update you on what little I do know. The best track, pictured above, was studied closely at the site by myself and Daryl Colyer. The track was cast the next day by TBRC member Brad McAndrews. Brad has been in the possession of the cast since. What Daryl and I observed at the site was very compelling, however. The track appears to have been made by an extremely flat-footed individual. There is no sign of an arch at all. The track was uniform in depth from toes to heel. 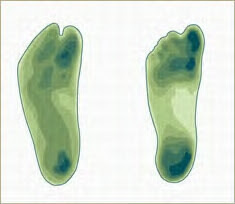 There was no evidence of the heel striking the ground first then rocking to the ball of the foot and toes for push off. The uniform depth of the track suggests the possibility of an individual exhibiting a compliant gait. In other words, the individual picks their foot up almost vertically, strides, and sets it down in a flat- footed manner. The entire foot contacts the ground, assuming it is relatively level, at the same time. This is the gait exhibited by the individual in the Patterson-Gimlin footage. This odd gait has been reported by some witnesses claiming to have observed a sasquatch in motion. Several other track finds have shown evidence of this same compliant gait. The track maker also seems to have had an enormous big toe. The possibility that some sort of sliding or slippage occurred thus making the big toe appear abnormally large was considered. However, there is absolutely no sign of this sort of sliding anywhere else in the track. The other four toes are imprinted perfectly and look like peas in a pod. The rest of the track, likewise, shows no signs of sliding so this was ruled out as the reason the big toe appeared so large. The big toe also exhibited a slight divergence from the rest of the toes. The gap between the big toe and the second toe was not huge, about a quarter of an inch, but it is noticeable. This divergence is not nearly as great as you would see in a gorilla or chimpanzee foot but is more than you would see in a normal human foot. This flexible big toe is something that has been speculated about based on other track finds around the country. We were not able to observe any evidence of a mid-tarsal break as is commonly reported in some alleged sasquatch tracks. However, the track is very similar in appearance to tracks left by the individual in the Patterson-Gimlin film at Bluff Creek in 1967. Some of the tracks left at the sight seemed to exhibit this feature. Other tracks simply appeared extremely flat-footed. The photo below shows a comparison between a casting made from the Bluff Creek site and a photo of the SE Texas track we located. They appear very similar. There is no doubt the tracks were made by a bipedal individual and are humanoid in form. However, "humanoid" does not necessarily mean "human." At least not in the way we typically think of human. Daryl Colyer has astutely pointed out that the track shares some similarities to the famous Laetoli tracks, which were created by a bipedal individual some 3.6 million years ago in Tanzania. The track maker was likely Australopithecus afarensis. The tracks are strikingly similar in form to the modern human foot but do exhibit some subtle differences. 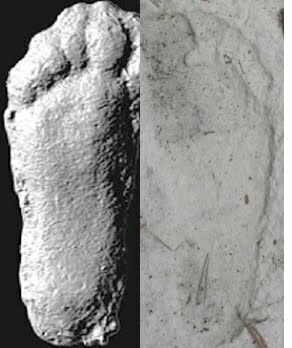 The diagram below illustrates the difference in how the Laetoli track (on the left) maker's foot struck the ground while ambulating compared to how a typical modern Homo sapien's foot (on the right) contacts the ground during walking. The darker the area on the diagram, the deeper the impact left in the track. You can also note the difference in the arches between the two species and the slightly divergent big toe in the Laetoli track. At least preliminarily, the SE Texas track seems to have more in common with the Laetoli track maker than it does with modern humans. Now, let's go back to the flat-footedness of the SE Texas track maker. Pes planus, the condition causing flat feet or fallen arches, while not exceedingly rare, is not common in humans. Estimates on just how many people suffer from this condition vary but let's err on the high side and say 20% of the population suffers from Pes planus. That would mean someone suffering from fallen arches was walking barefoot down a debris strewn creek bed. Also, don't forget that a second individual, who left smaller tracks with the same flat-footed characteristics, was also present in that creek. Statistics would seem to suggest this is unlikely. One other thing to consider is that flat-footed people generally are not hikers. This condition was, at one time, considered a serious enough hindrance to marching that it was cause to be denied entry into the military. I would guess that anyone with this level of flat-footedness would likely not find hiking particularly enjoyable. This individual would likely be wearing orthotic devices in each boot/shoe if they did decide to go for a walk. To think a person with fallen arches would go for a hike over a mile from any trail or road, take off their boots/shoes, which would likely contain their orthotics, then walk down a creek bed littered with pinecones, sweet gum balls, rocks , and sticks while dragging along a second individual suffering from the same condition begins to stretch the boundaries of credibility in my mind. In addition to this unlikely scenario, the track shows no sign of an increased angle of the big toe (hallux) inward, which is commonly associated with Pes planus. So, based on all of this, can I totally rule out a human as the track maker? The answer, obviously, is no. I do feel it is unlikely, however. No one piece of this whole puzzle proves anything. Like much that has to do with the sasquatch enigma, it is the totality of the evidence and circumstances that needs to be considered. When you put it all together it is extremely compelling. The biggest problem most seem to have with the track is the size. Since it is only 11-12 inches in length, the track falls well within the human size range. This being the case, some simply don't believe it could be anything else except a human foot print. If all the oddities of the track were present in a print that was 16-17 inches long there would be no discussion whatsoever. Having said all of that, I want to reiterate that I still have not been able to get a look at the casting. My opinions are based solely on my observations at the site and on the many photos I took of the track. Brad McAndrews, who is in possession of the casting, has a job requiring that he be on the road traveling quite a bit. He and I have not been able to find a day where we were both available to meet halfway between my home in Central Texas and his home in the Houston area. This highlights one of the difficulties with this whole endeavor (attempting to document the sasquatch). Those who are pursuing this animal are only able to get out in the field sporadically. Family and employment responsibilities take precedence and often interfere with efforts to get out in the field. This is the very reason that I was not able to cast this track myself. It was Mother's Day weekend and I wanted to be home on Sunday to be with my wife and children. As soon as I am able to meet up with Brad and get the casting I will update the site with photos and any new observations. I have just had the privilege of screening the new Ivory-Billed Woodpecker documentary Ghost Bird. The film, written and directed by Scott Crocker, does not attempt to convince anyone that the Ivory-Bill does or does not still exist. Rather, it concentrates on the people involved in the search for this iconic bird and the hope it has generated in a small Arkansas town. The film opens with video of the press conference where Gale Norton of the Department of the Interior, along with Dr. John Fitzpatrick, Director of the Cornell Lab of Ornithology, boldly declare that the Ivory-Billed Woodpecker has been rediscovered in the Big Woods wilderness near Brinkley, Arkansas. The scene quickly shifts to the small town of Brinkley where the news has awakened hope that the discovery will provide a desperately needed economic shot in the arm. Local business owners, the editor of the local newspaper, the mayor, and the head of the Chamber of Commerce are all interviewed and express hope that the discovery will be a boon to their individual endeavors and the town in general. The scene then shifts to those most directly involved in the rediscovery of the Ivory-Billed Woodpecker. David Luneau, Associate Professor at the University of Arkansas, tells the story of how he captured footage of what he and Cornell University officials believe to be an Ivory-Billed Woodpecker in flight. The footage was acclaimed by Cornell University as definitive proof of a surviving Ivory-Billed Woodpecker and is featured prominently in the film. Not everyone agreed, however. Dr. Jerome Jackson of Florida Gulf Coast University and Richard Prum of Yale University found enough room for doubt in the video to begin collaborating on a rebuttal paper. They later backed off their rebuttal upon hearing audio recordings made in the Big Woods area reputed to be Ivory-Bill in origin. The audio, according to Prum, was impressive; however, he has come to doubt that the audio recorded is actually an Ivory-Bill calling. - Dr. Carl Sagan, Donald Rumsfeld, et al. I could go on about the debate back and forth between these groups as to whether the Luneau footage actually shows an Ivory-Billed Woodpecker but I won't. The film, to me, is about more than that. Particularly compelling to me were the sequences where Nancy Tanner, widow of acclaimed naturalist Dr. Jim Tanner, was interviewed. The story of how her deceased husband traveled over 48,000 miles attempting to document the few remaining Ivory-Bills in the south was fascinating. Particularly interesting was the tale of how Tanner, then a Cornell grad student, found a recently hatched Ivory-Bill in a forested section of land known as the Singer Tract and wanted to band it. He shimmied sixty feet up a tree and successfully banded the bird. To his horror, soon after descending the tree, the young woodpecker hopped out of his nest cavity and plunged to the ground. Dr. Tanner felt his activity had caused the death of this incredibly rare bird. However, Dr. Tanner found that the bird had survived the fall quite nicely and managed to climb back up the tree to place it back in its nest cavity. The picture of Jim Tanner (I presume it is Dr. Tanner in the photo) with this young Ivory-Bill perched atop his head is surreal. Other photos and videos of living Ivory-Bills shot by Dr. Tanner were featured and aroused a sort of melancholy in me. The pictures and video were stunning and the fact they were shot in black and white seemed to add to the effect that I was viewing a relic from a time gone by...a ghost. Mrs. Tanner also shared the story of how the Singer Company sold their heavily forested land to the Chicago Mill and Lumber Company. The land was designated for clear-cutting which would have been devastating to the hopes to save the Ivory-Bill. President Franklin D. Roosevelt and other interested parties managed to raise enough money to buy the Singer Tract back from the lumber company; however, they would not sell and the land was cleared. Mrs. Tanner shared a photo of the forest before cutting and the same land years later. The forest was completely gone. Only a soybean field remained where once had stood a pristine virgin forest. Seeing the two photos side by side was jarring...and sickening. 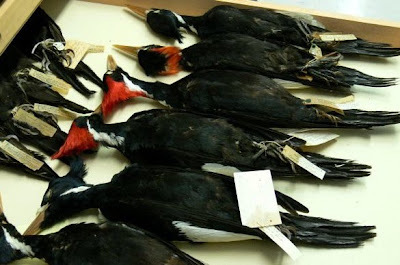 Many believe that once the Singer Tract was logged it sealed the fate of the Ivory-Billed Woodpecker forever. 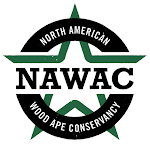 The failure to save the Singer Tract, and the Ivory-Billed Woodpeckers within it, led to the birth of the Nature Conservancy and, in 1973, the Endangered Species Act. Several universities were visited where representatives showed their collections of Ivory-Billed Woodpeckers. There was something unsettling about seeing these preserved specimens laying in drawers and knowing that the very act of collecting them likely helped lead to their demise. Other, now extinct, species like the Passenger Pigeon, Carolina Parakeet, and Eskimo Curlew were also shown. It was hard to look at them. To view the specimens and know that mankind was directly responsible for the extinction of these species was disturbing. Somehow, though these species became extinct long before I was born, I felt shame. If the director, Mr. Crocker, hoped to elicit an emotional response from his audience with these sequences I would say he was very successful. Also interviewed was Virginia Eckelberry. Her husband, the now deceased artist Don Eckelberry, is thought to be the last person to have seen a living Ivory-Billed Woodpecker in the wild. Mrs. Eckelberry shared the story of how her husband had been contracted by the Audubon Society to find and provide illustrations of the elusive woodpecker in 1944. He located one female Ivory-Bill, in the Singer Tract, and observed her for several days. His field sketches are remarkable and provide what seems to be the final glimpse of the species dubbed the "Lord God Bird." Again, one can't help but be saddened to think of this lone female, possibly the last of her kind, living out her life alone in the wilderness. The film, which started by documenting the hope and nearly frenetic efforts of Brinkley, Arkansas residents to capitalize on the rediscovery of the Ivory-Bill, shifts back to the again sleepy town several years after the Luneau footage was shot. The Cornell University researchers have pulled out and the promise of an economic boom based on Ivory-Bill mania has sadly remained unfulfilled. A local resident is interviewed as he drives through the dwindling town. An abandoned mill, a closed Coca-Cola plant, and a defunct garment factory stand like sentinels overlooking a mostly boarded-up downtown business district. The Ivory-Billed Woodpecker Inn is soon to become a Super 8 Motel and hope seems to be fading. The Ivory-Bill is still depicted all over Brinkley, Arkansas in the form of billboards, shop signs, posters, and license plates. However, there is a sort of sadness to them by the end of the film. They now seem almost like Christmas decorations still out in mid January. They look the same but, somehow, the magic is gone. Near the end of the movie a shot of a freight train leaving Brinkley is featured. I couldn't help but think it was symbolic of the hopes that the Ivory-Billed woodpecker, and, for that matter, the small town of Brinkley, can be saved. It is entirely possible it is too late for both. That train, it seems, may have indeed left the station. Ghost Bird is not the sort of film that will make it to your local Cineplex but I highly recommend tracking down a copy and viewing it when you can. 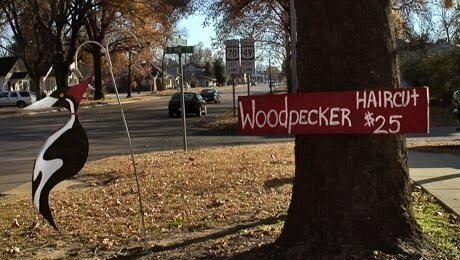 It is far more than a documentary about a woodpecker and is well worth your time. I enjoyed it immensely. The Ivory-Billed Woodpecker remains the Holy Grail for birders everywhere. This majestic bird has captured the imagination of the public like few other species. Why is this? Certainly, it is a striking and beautiful creature but I think it is more than that. The Ivory-Bill offers hope of redemption for we Americans who, while we loved the forests and wild places of our continent, failed to be good stewards of the incredible resources with which we were blessed. True, our failures are magnified by the extinction of such a magnificent bird. But if, somehow, the Ivory-Bill has survived then we would have an opportunity to make things right. We would have a second chance. Until, and unless, we get that chance we will be forever haunted by this ghost bird. 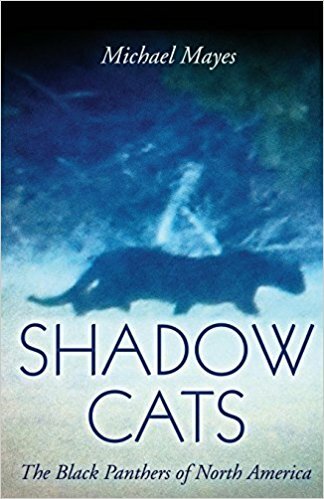 "Thinly spread forest creatures, with very large areas within which they might be scattered, are destined to remain phantoms. Their existence will always be extremely challenging to confirm; their extinction will be essentially impossible to establish." *I would like to express my gratitude to Zane Grochelle for contacting me initially about screening, and possibly reviewing, the film. It was my honor to do so. I'm still waiting to get my hands on the castings of the possible sasquatch tracks I and fellow TBRC member, Daryl Colyer, located last weekend. I know many are anxious to see pictures of the castings and I will update the site with those pictures and my opinions on what made the tracks as soon as possible. In the meantime, I came across an article on the Mineral Wells Index website about an ocelot that was found road-killed in Palo Pinto County, Texas. I felt it was especially timely considering the recent documentation of an ocelot in Arizona. You can access the article, written by Libby Cluett, here but I will try to sum it up for you below. The ocelot was found dead on U.S. 180, east of Palo Pinto by a county resident. The cat was a mature male weighing 35-40 pounds. The ocelot was, apparently, struck and killed by a car. The resident saw the cat, pulled over, and picked it up. Once the resident had the cat home she realized this was a special find. Why the resident decided to stop and pick up a dead cat on the side of the road is not clear. The story states that the woman thought she had picked up a bobcat. The cat was identified as an ocelot by the woman's husband once she had it home. The husband then contacted Texas Parks & Wildlife. "It's an extremely rare species, " Game Warden Matt Waggoner said. "It is getting attention." He went on to add, "It's so rare and not many people have any experience with the species." Waggoner also said, "The Texas Parks & Wildlife Department is making sure it is taking the time and doing it right with this animal." The TPWD will be conducting DNA tests on the ocelot in the hopes of deciphering whether or not it is truly a wild cat or an escaped pet (you just knew the TPWD would throw in the escaped pet theory didn't you?). "There is a possibility that somebody might have been illegally breeding these cats," said Waggoner. 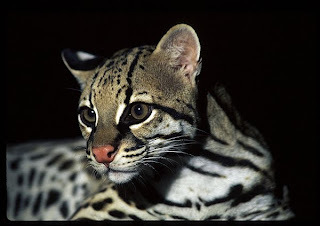 Currently, zoos are allowed to have ocelots but individuals can not. The cats are officially listed as endangered by the U.S. Fish and Wildlife Department. If the ocelot was wild it was a long way from what is generally considered home for the species. The cats are found in northern Mexico and south Texas. It is likely they are present in small numbers in southern New Mexico as well. The species was documented in Arizona for the first time just last year. Are ocelots recovering in sufficient numbers to be spreading north into areas where they have not been seen in decades, if ever, or are the existing few cats being forced northward by poachers or habitat destruction? There is no clear answer at this time but I hope it is the former. I just returned from a trip to the Piney Woods of SE Texas. The purpose of the trip was two-fold. First and foremost I was looking for potential camera locations for the TBRC's Operation Forest Vigil project. The secondary purpose, as always, was to look for any sign of our target species; the sasquatch. What a trip it turned out to be. I, and one other TBRC member, arrived at our destination mid afternoon on Friday 5/7. We established base camp at reasonably remote spot in the forest and settled in for the afternoon. We relaxed a bit and had a bite to eat while we waited for the sun to set. The plan was to wait until 10:00 or 11:00pm and then drive the back roads of the area hoping to catch a sasquatch attempting a crossing. This is exactly what I was doing when I had my visual in May of 2005. We ran the roads, with video camera rolling, until about 3:00am. We did not have any luck as we only saw deer but did identify an area that we wanted to return to explore the next day. 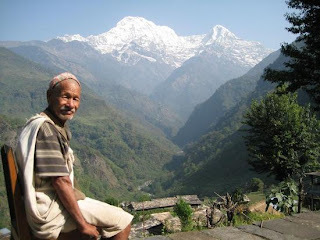 We returned to base camp at that time and called it a night. We did have a large visitor of some kind at base camp that night. I managed to sleep through the visit but my partner heard something heavy approach us sometime prior to daybreak. He did say he was almost positive it was a hoofed animal. Whatever it was snorted and then quietly made its way back into the forest. My partner did sit up and try to catch a glimpse of the visitor but did not manage to do so. In all likelihood it was just a buck or maybe a hog (though they smell so bad their visits are usually easy to identify). Again, I slept through the whole thing and my friend didn't think enough of it to alert me. Things didn't get interesting until the next day. We slept in a bit the next morning and didn't get geared up and into the woods until shortly before noon. A cool front had come through during the night and the day was perfect for hiking with temps in the upper 70s to the low 80s. We returned to the area we had identified the night before, parked my truck, and hiked into the woods. We were pleased to find several very nice looking spots for future camera deployments in short order. While looking for additional camera spots, we located a creek that winded through the area. This was a great looking creek bed. The bottom of the creek was easily 10-12 feet below the forest floor. We quickly realized we were looking at a wildlife super highway. Animals could walk up and down the creek bed and be totally invisible to anything or anyone above. We dropped down into the creek and quickly began locating wildlife sign. We spotted raccoon, opossum, deer, hog, and coyote tracks almost immediately, which confirmed our feeling that this was a travel corridor. We followed the creek as it meandered through the woods and soon came to a small sandbar against the wall of the gulley where the creek took a sharp bend. In the packed sand we saw numerous impressions that resembled footprints. There were three different sizes. One very large set of impressions measured 14-15 inches in length. There were only two of these impressions but they were very wide and impressive. Also present were several impressions that measured 11-12 inches in length and several more impressions measuring only about 8 inches in length. The two smaller sets of impressions were not as wide as the big set but more numerous. We were sure we were looking at bipedal prints but the tracks were pretty degraded so we could not be absolutely sure as to what made them. We continued down the creek and continued to find impressions. It seemed every time the creek took a bend we would find impressions in the areas where the silt had been pushed up against the walls of the creek bed forming sand bars. We did not find any more of the largest individual's impressions but continued to see the tracks of the other two individuals. We continued another 200 yards or so when we located another group of tracks. The smaller impressions were everywhere. The little guy/gal seemed to be running around having a fine old time. There were only a couple of tracks of the larger individual. It was as if the adult had been patiently standing and watching the smaller individual frolic about. That is pure speculation, of course. What is not speculation is that one of the prints left by the larger individual is the clearest and most pristine track I have ever seen in the wild. The print measured 11-12 inches long and clearly belonged to the same individual we had been tracking. The toes were crystal clear. The track showed little to no evidence of an arch. The track was only imprinted into the sand a half inch or so. However, the sand was packed extremely tight and our boots barely left any imprints at all. The big toe was huge and showed a slight divergence from the other four toes. We photographed the track from every possible angle and continued to track the pair until the creek split. The two of us split up with each of us following a separate branch for a hundred yards or so. I located one more track, belonging to the smaller of the two individuals, but that was it. We continued down the creek but found no other sign of the pair. They either exited the creek bed or backtracked and took the other branch. All together we were able to track these two individuals for more than a quarter of a mile. It was truly a remarkable track way. There can be no doubt that we were following the tracks of bipedal individuals. There can also be no doubt that they were either humans or sasquatches. There are simply no other possibilities in my mind. If you study the photos of the best print provided here, I think you will agree that these are the only two possibilities. I can't divulge too much information on the area where the tracks were located due to the fact that the investigation is active and ongoing. I can say that the portion of the creek bed where the tracks were found is very remote and is not close to any road or home. The forest floor and creek bed were both littered with debris such as rocks, sticks, sweet-gum balls, and pinecones that would make it an unlikely place for a human to go barefoot. When you add the possibility of poisonous snakes, the area is home to rattlers, cottonmouths, and copperheads, the likelihood of people traipsing around without shoes seems very unlikely. The possibility that a family was out on a hike and decided to enter the creek to soak their feet was considered. However, not a single sign of human presence was noted. There were no shoe or boot prints to be found. The individuals traveled in excess of a quarter mile without shoes of any kind. The facts that the tracks were found in an a very remote location, that the terrain is extremely inhospitable to barefoot walking, and that the area is home to several species of poisonous snakes make it unlikely, in my mind, that humans made the tracks. Certainly, it is possible humans are responsible. People do strange things to be sure and turn up in unlikely places. While a stop on a sand bar in the creek and a quick soak of the feet seems possible, a barefoot stroll in excess of a quarter mile down this creek bed stretches credibility. As I type this entry, three TBRC members who live in the general vicinity are at the sight casting the track. If all goes well, I will have photos of the casting up soon. I am hopeful that we can discern once and for all if the maker of the track was human or not. 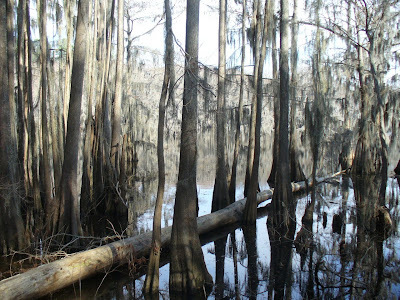 I am off for three days of brush busting in the woods and swamps of SE Texas looking for sign of our big hairy friend. That being the case, there will likely be no posts until my return early next week. I will update the site with photos and a summary of my activities Monday or Tuesday. I saw the following quote on Regan Lee's Frame 352 blog. I liked it so I borrowed it to post here. You can interpret this quote many different ways, I suppose. Rather than my telling you what I get from it, I would like to hear what you think think about it. Feel free to leave your interpretation in the comments section below. Bigoot Bloggers: An Endangered Species? Recently, several bigfoot related blogs have disappeared. Some of the writers of these now defunct blogs gave reasons for their shutting down their sites while others did not. The Blogsquatcher, Skookum Quest, and The Search for Big Red Eye sites, to name a few, have all gone the way of the dinosaurs (The Search for Big Red Eye site remains up but dormant) over the last year or so. These were three quality sites with different viewpoints and thoughts on the subject of the sasquatch, as well as other subjects from time to time, that I miss. I could name others but you get the point. It seems there have been a lot of sites that are shuttering their doors all at approximately the same time. The question is why? What is going on? The reasons for getting out of this field are likely as varied and unique as are the researchers/bloggers themselves. I do think the one common theme is one of frustration. In my opinion, there are basically three areas of frustration that those who invest themselves in searching for and writing about this creature have to endure. These frustrations would be the lack of, and the inability to obtain, hard physical evidence, the lack of respect for the subject from mainstream media and scientific establishment, and last, but definitely not the least, the lack of civility shown between groups and individuals who, supposedly, have the same ultimate goal of discovering this animal in mind. The inability to bring in a body or obtain solid physical or photographic evidence year after year has discouraged many who have sought the sasquatch. It is especially hard for those who have seen one of these creatures and know they exist. This frustration is compounded nearly exponentially if the person has told others of his/her sighting. This factor also weighs heavily on any scientist or academic that puts himself "out there" by even entertaining the possibility that the sasquatch is a real animal. It seems things go one of two ways for these folks most of the time. Some, Rene Dahinden comes to mind, become obsessed with finding the creature. This obsession can, and has, led to divorces, broken families, lost reputations, and financial ruin. Obsession, in general, is an unhealthy thing and leads to an unbalanced life where everything besides the subject of said obsession suffers. The end is generally sad and lonely for these folks. Often it works out a little differently. Sometimes the person in question eventually just burns out and hangs it up. Their best efforts have failed to turn up the evidence they desired, they are chided and derided about their interest in the subject, and just get tired of, seemingly, banging their head against a wall. These folks decide their pursuit is fruitless and, in some cases, unhealthy so they just turn their back on the whole subject and walk away. This seems to be the type of frustration, in my opinion, that led D.B. Donlon, the Blogsquatcher, to hang it up. I don't for one minute think Mr. Donlon no longer finds the subject interesting. I do think he has come to the conclusion that, for him, the pursuit of answers to the sasquatch enigma is an unhealthy pursuit. 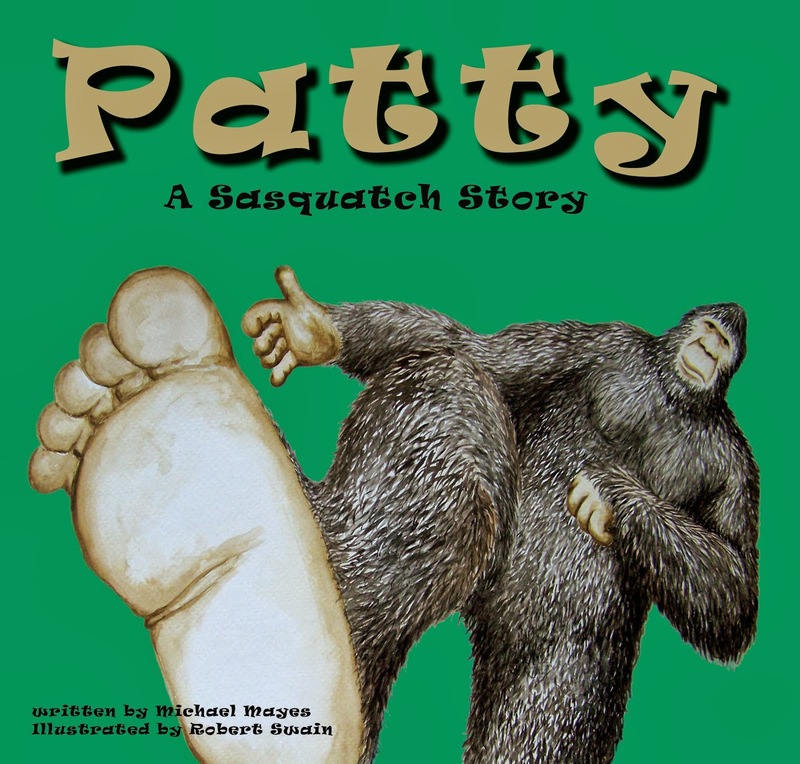 The second sort of frustration felt by many who show an interest in the subject of sasquatch is the lack of respect for the subject shown by the mainstream media and scientific establishment. The subject is, more often than not, treated with disdain by "real" scientists. To show interest in the bigfoot phenomenon is often akin to committing career suicide. Dr. Grover Krantz was denied tenure for years because of his insistence on pursuing his interest in the sasquatch. It is my understanding that several years ago a faction of the Idaho State University faculty wrote a letter to the University president and/or Board of Regents demanding that Dr. Jeffrey Meldrum cease his very public pursuit of the facts behind the sasquatch mystery. This faction stated that Dr. Meldrum was, and I paraphrase here, embarrassing the university. Nothing came of the campaign and Dr. Meldrum remains at Idaho State University. However, I have to believe that there is a palpable tension on that campus between Dr. Meldrum, his supporters, and at least some of his fellow faculty members. The mainstream media is a horse of a different color. The print media, at its worst, treats reports about the sasquatch as a complete joke. Witnesses are portrayed as buffoons and uneducated bumpkins. Stories are often reserved for "special" occasions like April Fool's Day and Halloween. At their best, the print media plants tongue firmly in cheek when dealing with a bigfoot related story. Often, most of an article is fine until the last few lines are read. It seems most reporters can't just report the story. They just have to interject a little jab of some kind as if to show their readers that they are not being taken in by such foolishness. The type of treatment the subject receives from the electronic media varies wildly. Some programs have actually been quite good. National Geographic's recent special "Bigfoot" was probably the best program on the subject I have seen. However, not too long ago, National Geographic produced one of the most laughable hack jobs on the subject I've ever seen on their Is It Real? program. The Discovery Channel's "Sasquatch: Legend Meets Science" was good as was the History Channel's "Giganto: The Real King Kong". It seems, however, for each decent program on the subject there is a terrible one that seems to have set out to discredit the entire subject. I've seen programs where serious scientists were interviewed only to be followed by the "I was a bigfoot love slave" claimants. To be lumped in with these people is infuriating, demeans serious scientific analyses, and leads to distrust of the media as a whole by witnesses and researchers who never really know how they will be portrayed on a given program. To be assured that you will be treated respectfully only to be portrayed as a simpleton once the editing is complete is disheartening and, if it happens often enough, can lead to people just throwing up their hands and walking away. Lately, it seems, that one of the biggest reasons people abandon the subject is due to the fact individual researchers and groups just can't seem to get along. The sniping, backbiting, and pettiness that goes on between those looking into this subject is truly staggering and something that I've never completely understood. I suppose some of it is due to a feeling of being in competition with one another but I think it goes beyond that. We, as a society, seem to have lost the ability to disagree with one another without getting overly emotional and irrational. You see it in the political realm every single day. If someone doesn't agree with you, they are obviously an idiot and possibly dangerous. Civil debate and discourse is dead. Much of this, no doubt, comes from insecurity. Many of the so-called "experts" in sasquatch research are anything but in reality. When called out on half-baked theories that have no basis in fact or for reaching conclusions based on shoddy science they lash out with personal attacks against anyone who would dare question them. Another source of hostility between researchers stems from different philosophies when it comes to evaluating witness testimony. I, for one, just don't automatically believe everything I am told when someone claims to have seen a sasquatch. I probe a bit. I look for inconsistencies. I investigate to see if it is possible they are mistaking a known animal for a sasquatch. I try to discern if they are telling me the truth. Some think that to question a witness is akin to badgering them. To not take their claims at face value is disrespectful. This leads to some pretty serious disagreements at times. I, myself, was criticized in some circles for some of my thoughts in regard to my investigation on the San Antonio sasquatch sighting several months back because I did not find the witnesses to be credible. I have seen some amazing claims made on some forums that are simply beyond belief. I saw a string where one person claimed to have a pack of these animals living on their land. This person's children, it was claimed, played with bigfoot juveniles daily in their back yard and were taught to catch fish with their bare hands and to swim by the sasquatch parents. When I asked this person why they had not taken a photograph of these incredible events they replied cryptically that they wanted to protect the bigfoot family from outsiders. When I commented that broadcasting to the world about these events seemed to be inconsistent with the stated goal of protecting the animals I was dressed down by dozens of other forum participants. I stated that I didn't understand why, if you really wanted the animals to remain unmolested and all of these events to remain a secret, you would say anything at all. To tell these sorts of tales is to invite questions and attention. It didn't jibe with me then and it still doesn't now. If it were possible to be tarred and feathered via the world-wide-web it would have happened to me that day. To question, to probe, to investigate is simply not welcome behavior in some circles. These differences in philosophy are incompatible. When disagreements arise, comments bordering on slander are often thrown around for months on various sites. After a while some simply no longer have the energy to fight the good fight and defend themselves. They get sick of childish name-calling and arguments. Soon, if bloggers are not careful, all that is being written are rebuttals to the theories of others or posts defending themselves from some attack by another researcher or group. It is something one can get a belly full of in a fairly short amount of time. Some choose to just walk away for good instead of engaging in such nonsense. I don't know exactly how much these three types of frustrations are playing into these bloggers decisions to walk away. I truly believe that to some degree these factors have affected them all. It is just my opinion. Looking back on this post, which is much longer than I intended, I see that I have possibly projected my own frustrations onto these writers and thinkers who have chosen to discontinue their work in this subject area. However, I think, given the subject matter, that is unavoidable to some degree. Please feel free to comment below. I am curious to hear what people think about my thoughts on this. I am not threatened if someone disagrees with me. I ask only that you keep it civil. I will look forward to hearing from some of you. This could get interesting. Well, I've finally caved and put up a page on Facebook. I resisted as long as possible but it proved futile and have now been assimilated into the social networking world. You can access the page here. I would appreciate your checking it out and hitting the "Like" button. It will be pretty embarrassing to have no "Likes"or fans.